I'm a bit late but there's a new food competition: Supermarket Superstar on Lifetime TV! Have you started watching it? Basically these are for folks who want to get their food products on supermarket shelves nationwide and each week has a theme (desserts, spreads, etc). 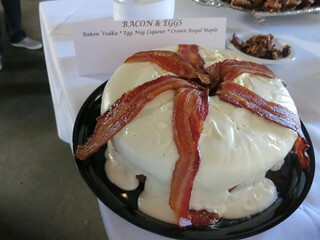 They had a preview of the actual food that would be on the show a few weeks back, and I was impressed by the creativity of many of them! The show is now set for Thursdays at 10:30pm. Just like Don Chow, the concept is Mexican food meets Chinese. 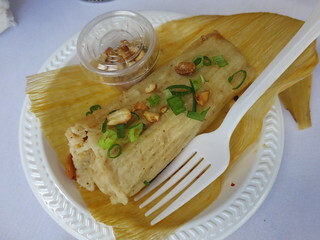 These are tamales spiced with Chinese five spice and stuffed with Kung Pao Chicken (complete with peanut toppings). 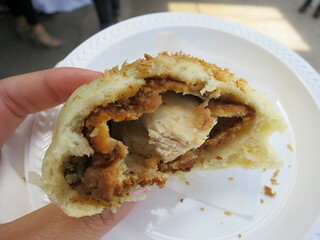 Fried chicken bao from Ben Vancleave, set for the episode of Snacks. He also had other bao filled with pulled pork and other Southern food items, but this one was the one on the show. So fun! 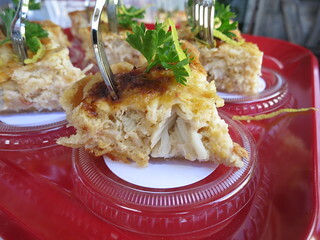 The Crab Pie from Monica Van Cleve was really good, chock full of crab! Among the mentors was Shiela G who already has her Brownie Brittle products in supermarkets. They're these addictive crispy brownie chips. There were snacks made with grasshoppers, beer and bacon jam from The Beer Baroness, and more. Should be a fun show!